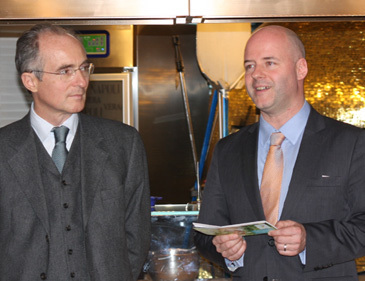 ITCCK President Nicolas Piccato (right) makes his speech while Italian Ambassador to Seoul Sergio Mercuri looks on at the ceremony held at Vera Restaurant in Hannam-dong, Seoul on Jan. 26, 2015. The Italian Chamber of Commerce in Korea (ITCCK) announced on Jan. 26, 2015 that three more Italian restaurants in Korea have been awarded with the prestigious "Ospitalita’ Italiana” certificate at the end of last year. 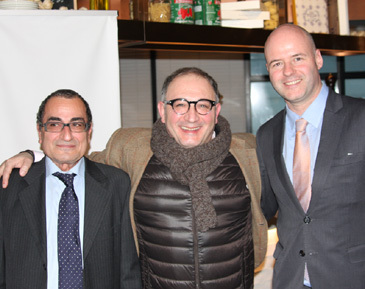 On Jan. 26, 2015 the Italian Chamber hosted the certificate awarding ceremony at the Italian restaurant “Vera” in Seoul’s Hannam-dong area near with the presence of Italian Ambassador to Seoul Sergio Mercuri. 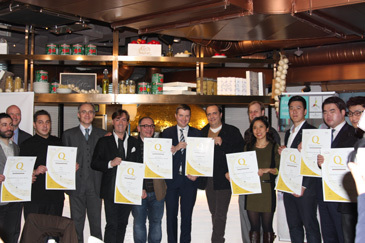 Italian Ambassador to Seoul Sergio Mercuri (4th from left) poses with the recipients of Italian certificates at the ceremony held at Vera Restaurant in Hannam-dong, Seoul on Jan. 26, 2015. During the ceremony the three Italian restaurants were awarded with the much-coveted “Ospitalita’ Italiana” plate and certificate. During the event the 10 other Italian restaurants already certified in the past years receive the confirmation of renewal from the Italian envoy. The confirmed restaurants for the period 2014-2015 are: Atrio (Conrad Seoul), Buon Posto, CasAntonio, Cornerstone (Seoul Park Hyatt), Cucina (Grand Hyatt Incheon), Harmonium, Paolodemaria Fine Trattoria, Peninsula (Lotte Hotel Seoul), Ristorante (Hotel Nongshim Busan), Ristorante EO, and Sky Lounge (InterContinental Seoul COEX). ITCCK President Nicolas Piccato (right) poses with ITCCK Sec. Gen. Robert Martorana (left), and Executive Chef Sebastiano Giangregorio of Lotte Hotel at the ceremony held at Vera Restaurant in Hannam-dong, Seoul on Jan. 26, 2015. Each representative of the restaurants received the plates and certificates from Amb. Mercuri. The welcome speech was delivered by the Italian envoy, ITCCK president, and President Antonio Patella of ITCCK F&B Committee, respectively. The whole event was officiated by ITCCK President Nicolas Piccato. “Ospitalità Italiana” is the certification in hospitality recognized by the Italian government. It was created to protect consumers and promoting the traditions of Italian agricultural and food products and value Italian gastronomic culture. In Italy over 5,000 Italian hotels, restaurants, and holiday farms were certified by the Italian government. Overseas, the certification is restricted to restaurants and some 1,000 have been recognized worldwide.